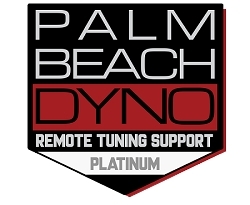 Our Forced Induction Remote Tuning can be done in a variety of ways, but the important detail is that Palm Beach Dyno is tuning your vehicle through the internet at your location. A base file is provided according to the modifications on your vehicle. You then log the car per our instructions and email it to our support site (http://support.pbdyno.com). We will review the datalog, create a revision if necessary and provide further instructions. This process is repeated until the car is fully tuned both at WOT and part throttle. The logging can be done on a dyno of your choice, while driving the car on the street or a combination of both. 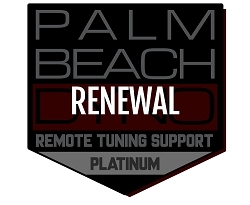 Our Remote Tuning Services are offered with 3 different levels of support so you can choose the service that best suits you. The initial remote tuning process is the same for all package levels, the difference between the packages is in the support included. We currently support all 2011+ V8 applications remotely. 2010 and earlier vehicles can be tuned remotely on a case by case basis or through one of our Dyno Dealers. Silver Level Remote Tuning - This option is a good choice for the majority of our customers. It is perfect for the customer who wants a top performing tune for their current modifications but does not intend on doing updates with many trips to the track. Updates are not included when doing new modifications to your vehicle but can be purchased as needed. 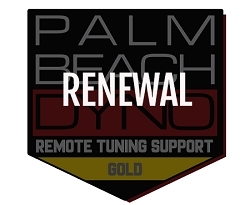 Gold Level Remote Tuning- This is a good choice if you plan to make some changes to your vehicle, as many updates are included. Gold Level also adds telephone technical support during normal business hours and two free Remote Trackside Support Sessions. This package is perfect for the person who enjoys fine tuning their car with different parts over time and fine tuning it at the track. With the Remote Trackside Support Sessions included, it allows you to squeeze that extra ET out of the car in a short amount of time. 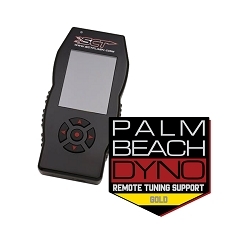 Platinum Level Remote Tuning- This is the perfect choice for the most competitive people out there who are constantly changing things up in search of even the slightest improvement in ET or an extra few MPH at a speed event. Platinum Level Support includes extended phone support 7 days a week from 9am to 9pm Eastern Time. It also includes 7 Remote Trackside Support Sessions. 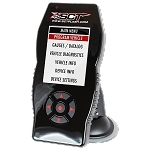 Not only can the Remote Trackside Support Sessions be used to dial in the car initially, they can also be used for a specific event like a drag race or half mile event. Even the most dialed in car needs to be fine tuned for any particular surface. If this is the level of support you are after, then Platinum Level is for you.